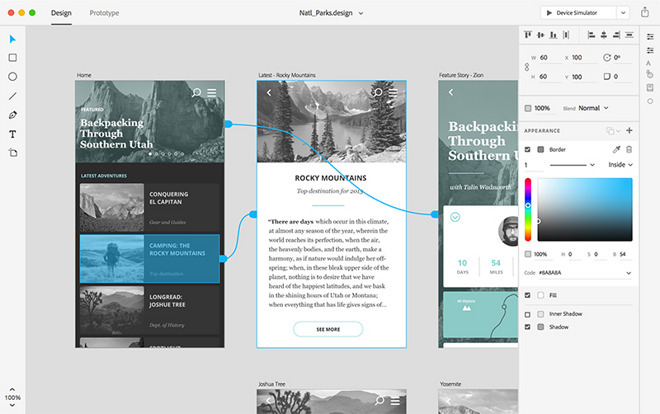 Developed under the name "Project Comet," Adobe on Monday announced an early release version of Experience Design (XD), a mobile app and webpage user experience and prototyping tool boasting a streamlined interface, hooks into Adobe's line of CC products and numerous preview options. 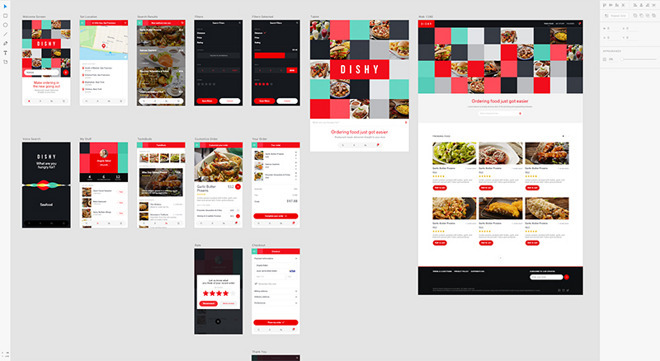 The preview, open to anyone with an Adobe ID, allows users a streamlined path to creating a design-forward mobile app or webpage mockup that can be shared with developers or clients. A purpose-built app, XD packs in powerful tools to facilitate fast prototyping with professional results. Adobe XD includes a number of tools for quick graphics layouts, with user interface assets built in for today's major mobile operating systems, including iOS, Android and Windows Phone. For example, the app comes with fonts, buttons, images and color palettes built-in, leaving the user free to experiment with different dynamic layouts. In a demonstration, it took Adobe's Andrew Shorten about ten minutes to build an iOS app mockup complete with graphics, text, links, transitions and more. Starting with a blank canvas users can compose individual panes and fill the predefined work area with a host of graphical assets, including titles, text bodies, lists, maps and images. With XD, Adobe is looking to simplify the prototyping process through the use of intelligent software tools. Using image insertion as an example, XD uses a drag-and-drop auto-masking image box that requires far fewer steps to mask out an image than manually inserting, measuring and masking. Other improvements include auto-populating lists, an integrated vector graphics system and support for Adobe Illustrator CC and Photoshop CC files. In addition, the large workspace provides ample area for wire-framing, or linking certain onscreen assets to different app or Web panes. To create wireframes, users simply draw a wire from one point, such as an interactive button or image, to a second page. The app features a tool to mimic commonly used transitions like page slides for a more immersive evaluation experience. Among the various viewing options is a dedicated prototype mode useful for testing out interactive hotspots like buttons, while a desktop preview mode that displays changes in real-time allows for dynamic A/B testing. Users also have the option to post a fully-functional prototype to the Web, which can be shared for remote assessment. Adobe XD CC is available for Mac users as a free download from Adobe's website. The company expects to release a shipping version later this year, with companion apps for iOS and Android, deeper Photoshop CC and Illustrator CC integration, and support for other Creative Cloud assets planned for future iterations.